Create an inviting atmosphere in your bird garden with the Wing and A Prayer Holly Bird House. This dual-level home brings height, architecture, and beautiful design to your yard with ease. The square frame with beadboard-inspired siding lends a classic silhouette to the item, with a pitched metal roof and finial completing the effect. A small ledge around the center of the house visually divides it, while creating takeoff or perching spots for nestlings. Four 1.5" diameter entry holes lead to four separate chambers, to house a few avian families at once. A metal predator guard surrounds each entry, preventing squirrels or woodpeckers from enlarging them. Crafted from solid PVC trimboard, this house is made to last and will not mold, mildew, or delaminate after exposure to the elements. The white color of the home lends an elegant feel to the piece, enhanced by the copper colored metal roof and predator guards. 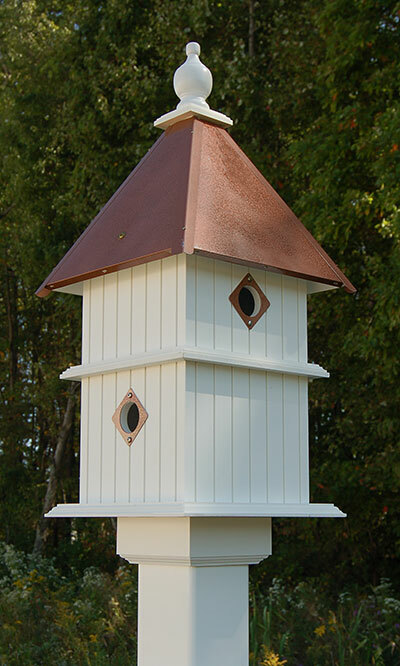 Place this home on a 4" x 4" post (not included) using the preinstalled mounting collar, for easy and striking installation. Welcome birds into your yard with this Holly Bird House. Made in the USA.